Mels Box of Chocolates: A Birthday Party Fit for a Princess!! A Birthday Party Fit for a Princess!! 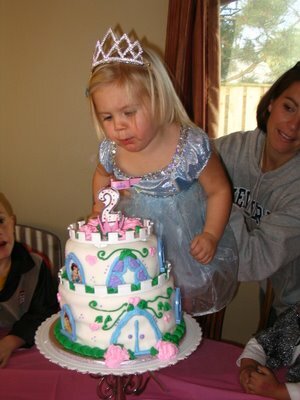 Hear ye, Hear ye, Princess Zoe had a royal celebration on Sunday, October 15th to celebrate her 2nd birthday! The princess is waiting for her royal subjects to arrive for her birthday party. 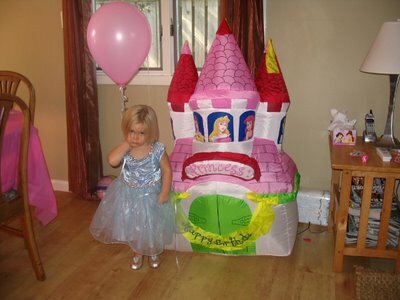 She has her balloon ready and is trying to wait patiently besides her birthday castle. Zoe was waiting for two days to blow out the candle on this cake. It was definitley a cake fit for a princess. It was delectable with vanilla cake and chocolate frosting and was beautiful with the Disney princesses looking out the windows of the grand castle.